Rennie was born 25 July 1885 (birth certificate number 1885/9708) in Auckland, New Zealand. It could be said that there is a question mark over who was Rennie’s natural father, due to the fact that he leaves New Zealand with his mother at about age 3 or 4, might indicate that he could be the son of Albert and Elizabeth. 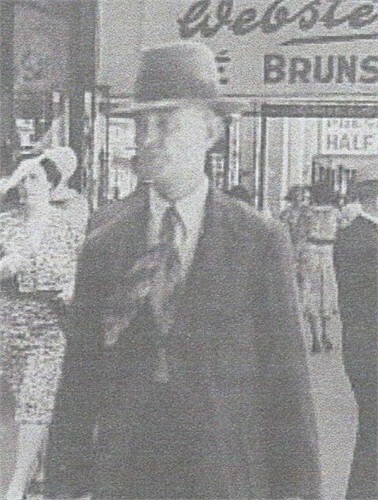 In the Supreme Court, Brisbane, on the 8th inst., before Mr. Justice Real, the hearing of an interesting trades union case was commenced, Rennie Heath Standley, a minor, suing, by his father (Albert Standley), the Queens-land Typographical Association and fourteen others, claiming from each and every one £500 damages and an injunction restraining them from continuing to perform certain actions complained of. According to the statement of claim, the plaintiff was employed in July, 1905, by the Daily Mail Newspaper Company, Brisbane, as a galley boy and casual reader at 30s per week, the company to allow him to learn to work the linotype machine. In August last, the plaintiff alleged, the defendants, by wrongful and malicious threats, acts, and conduct, induced the company to refuse to perform any part of the agreement, and forbade the plaintiff entering on the performance of his duties, and caused the agreement to be cancelled. The plaintiff also alleged that defendants conspired wrongfully to induce the company to take the action it did, and thus caused the plaintiff to be deprived of his chances of employment with the company. The second record we have of Rennie is in the Australian Electoral Roll in 1908, which has him, aged 23, living with his parents at 98 Holman Street, in Brisbane, Queensland and working as a Printer. On 20 September 1910 Rennie marries Eva May Hammond (Marriage Certificate number B009308), in Brisbane, Queensland, aged 25 years. On 5 July 1912 Rennie and Eva have a daughter, Zena Estelle Una (1912–1996). By the 1913 Electoral Roll Rennie and Eva have moved to 168 Susan Street, Fortitude Valley, Brisbane and is now working as a Linotyper. Rennie is a linotyper until his retirement at the age of about 60. The linotype machine is a “line casting” machine used in printing. Along with letterpress printing, linotype was the industry standard for newspapers, magazines and posters from the late 19th century to the 1960s and 70s. A bank of linotypers at work. 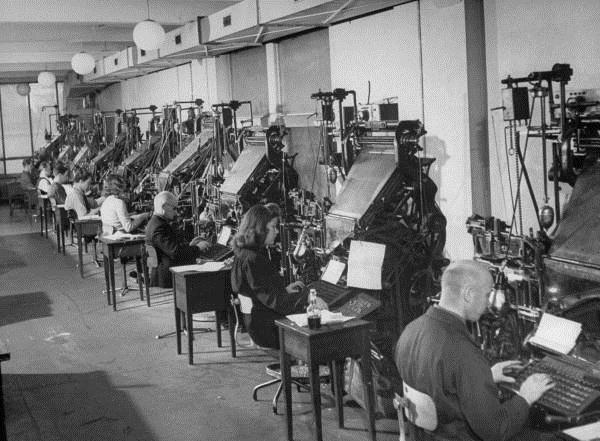 The linotype machine operator enters text on a 90-character keyboard. The machine assembles matrices, which are molds for the letter forms, in a line. The assembled line is then cast as a single piece, called a slug, of type metal in a process known as “hot metal” typesetting. The matrices are then returned to the type magazine from which they came, to be reused later. This allows much faster typesetting and composition than original hand composition in which operators place down one pre-cast metal letter, punctuation mark or space at a time. On 22 July 1914 a son is born Rennie Heath (1914-1996). Rennie and Eva with their young family live in Fortitude Valley until 1958 when they move to Merthyr. On 15 June 1962 Rennie passes away aged 76 (Death Certificate number B051899). Eva passes away two years later on 23 August 1964 aged 83.